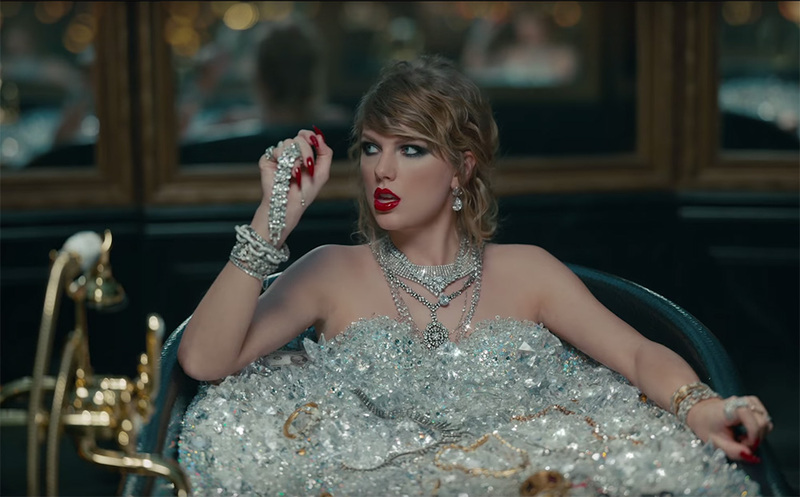 Taylor Swift makes history with her new song "Look What You Made Me Do". She got in a very short time to the number one spot in the hit parades both in Europe and in the USA. Besides being a great song with quite some real-life related deep messages and having a top of the art video this song has a lot of sparkle in it. Taylor wears abundant diamond jewelry, showing her as a near goddess in her red outfit sitting on her golden throne. She bathes in a bath full of diamonds whilst playing with her diamond jewelry. The message is clear, gold is clearly second to diamonds. Portraying diamonds as the ultimate high-end jewels is a welcome message for the diamond industry. It makes me almost wonder if she was sponsored by De Beers for this. And Taylor Swift is not alone, also the top hit "Wild Thoughts" by DJ Khaled and Rihanna has some diamonds in it. "Diamonds ain't nothing when I'm rockin' with ya", "Diamonds ain't nothing when I'm shinin' with ya". Glamour and diamonds, and great music, could this get any better? by Editor, posted Sep. 05, 2017.